Their scientific name is Sciurus carolinensis. They were introduced from USA /Canada to approximately 30 sites in England, Scotland and Wales from 1876–1930. Grey squirrels eat seeds, buds, flowers, shoots, nuts, berries and fruit from many trees and shrubs. They also eat fungi and insects, and occasionally birds’ eggs and fledglings. They will will strip bark from trees during the summer months. They store nuts in the ground in the autumn, but do not remember where they store them. They rely on scent to find them. The male and female are usually called a buck and doe. They can be right- or left-handed! Squirrels molt their coat twice a year, once after winter and then in the late summer before the weather gets colder again. They do not have ear tufts. They can live to 5-7 years of age. They have four fingers and five toes. The upper fur is mainly grey with mid-brown along the upper back, and chestnut over the flanks, limbs and feet. Their underside is white. The tail hairs are grey, banded with brown and black and a white fringe. Their body is 24–26cm long and their tail is 19-24cm in length. 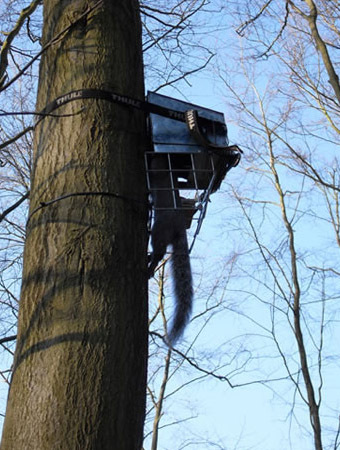 Squirrels live high in trees in a nest made from twigs, leaves and moss. This is called a drey. More recently they have taken to living and nesting in loft spaces. The drey may be in a hole in the tree or set against the trunk and branches. Pregnancy lasts 44 days and their young are called kittens. Kittens are born with their eyes closed, without teeth and with no hair. After about seven weeks they look just like small versions of their parents and are ready to leave the drey. Average densities in broadleaf areas are approximately 8-18 grey squirrels per hectare, and 0.1-1 per hectare in coniferous areas. They do not hibernate over winter, but may be less active when weather conditions are bad. They can hang upside down!